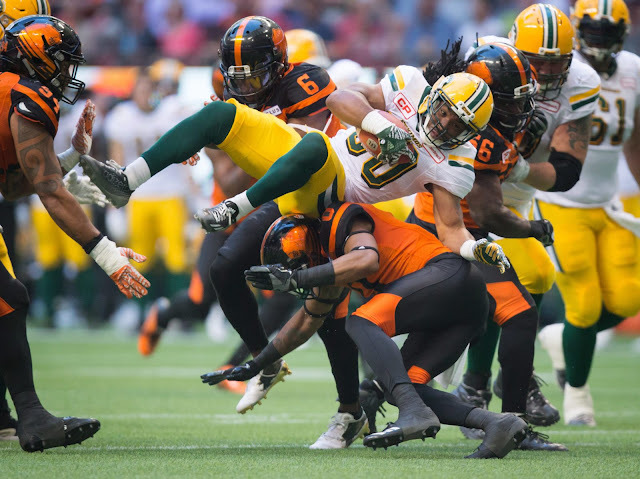 VANCOUVER - Sean Whyte kicked a nine-yard field goal with no time left on the clock as the Edmonton Eskimos defeated the B.C. Lions 30-27 on Saturday in the opener to the CFL season for both clubs. The winning points were set up by Mike Reilly's 76-yard completion to Brandon Zylstra with 36 seconds left after B.C. had tied the score on backup quarterback Travis Lulay's two-yard plunge 20 seconds earlier. But rookie kicker Ty Long missed the extra point that would have given the hosts the lead before Edmonton stole the victory late. Reilly wound up 20 for 28 passing and threw for 315 yards and two touchdowns. D'haquille Williams and Vidal Hazelton hauled in the TD grabs for Edmonton, while John White added another on the ground. White finished with 104 yards rushing on 17 carries, while Zylstra had seven catches for 152 yards. Whyte had three field goals and three extra points. Horrible kicking by BC, horrible defence by BC. I guess Wally should be fired! These so called kickers in the CFL are a Joke. You should never miss a chance of winning a game by missing a damn convert little own a 45 yard field goal. These guys just aren't Pros at all. Yeah, no sense playing the other 17 games. Only it will be the Stamps not the lowly smos that finish on top. Exciting games to start the season, great entertainment. To the wannabe regarding CFL kickers, so NFL kickers never miss? Must be pretty boring games with everyone so perfect. Put your head back in your A$$ where it belongs. It's only 1 game. But can we put to an end the party line that Jones & Murphy "discovered" all that talent with their former teams & Hufnagel & Hervey had nothing to do with it? Jones & Murphy got FAR too much credit. With them gone, they can't get the credit for Daniels, Zylstra & Williams who look a whole lot better than Holley (Collins was a Bomber cut so no Jones' discovery & Edwards is gone). It seems EVERY good player that was brought in during Jones time in Edmonton he got credit for when he came to Regina & Hervey was just some schmuck who sat around while Jones did all the work. We've got a lot of new players who Jones brought in here but I don't see too many outright stars "discovered" by those two. Maybe they'll emerge this year - or not. Sorry but the Eskies did need Bowman...he is the reason Zylstra and Williams were targeted as well as they were due to B.C double teaming him. Other teams our going to have troubles holding the offence down from Edmonton with so much talent throughout the squad...you will see rookie mistakes but once the team gels I feel sorry for the rest of the league. Happens in the NFL all the time bud, you're funny. Nobody says they don't need Bowman. He"s still the guy. Teams can't afford to double cover him all day - Esks have too many weapons. Sad attendance in Vancouver, it looks even worse in Toronto can't be 10 thousand there. How long can those teams survive with dwindling attendance? Who cares which person discovered whom, as long as they work out and the Riders progress towards a half descent season. In the past bub, just like your best days. At least we were there. Your smoes were golfing. How'd that feel. Hey smoes fan, time to get politically correct and change that disrespectful name. Join the new world. Talking about teams golfing I think your riders know it best with 4 grey cups pal...Edmonton is second in holding the most. What time is it? Answer- Its high time the Roughriders trot out Quinn Van Glyswyk to do all the kicking chores. He could of, would have, made that easy 45 yd field goal with a blind fold on. Hell, I could have made that one looking away faced backwards giving it the ole mule mule kick for the win creating over the top pandemonium in Riderville. Bartel- Crapigna, trade them both and get some valuable players assets in return. Can't do your job your paided to do, time to get out of town.